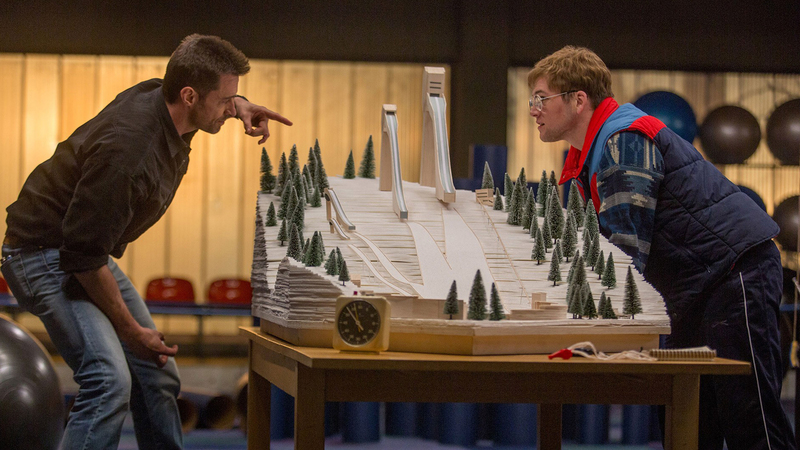 Inspired by the life of Michael ‘Eddie’ Edwards (Taron Egerton), Eddie the Eagle tells the uplifting true story of the unorthodox British ski-jumper, renowned for his eccentric style and simpleton appearance, who was eventually nicknamed ‘The Eagle’ by tabloids due to his unwavering spirit to never stop believing in himself. Growing up in Cheltenham, Gloucestershire, Michael Edwards had only one dream, and that was to become an Olympian. However, achieving this goal was not going to be easy, as Eddie was not blessed with any God-given athletic skill set. Throughout his childhood and adolescence Eddie tried his hand at various sports and competitive disciplines, against his father Terry’s (Keith Allen) will, who was sick and tired of Eddie’s ‘daydream’ antics and wished his son would just get his head out of the clouds and land himself a ‘real’ job. After years of perseverance, Eddie finally settled on a sport, downhill skiing, until narrowly missing the Great Britain team in that event — who went on to compete in the 1984 Winter Olympic Games. Coaching Tip #1 Don’t Die. Still, this underdog wasn’t going to give up that easily. To improve his chances at qualifying for Calgary in 1988, Eddie decided to rethink his entire game plan, choosing to tackle an alternative sport: ski jumping (which just so happened to extremely dangerous). Nevertheless, there were several holes in Eddie’s ‘absurd’ scheme: 1) Britain had never before had a ski jumping representative at the Winter Olympics and 2) Eddie was a novice who had not yet attempted a ski jump in his life; making matters worse, Eddie was heavier than most competitors, all of whom started their training at very young age, and wore thick glasses which would surely mist up in the icy conditions. With more-or-less no funding and next to no training, this unassuming hero sets off on a near impossible journey, taking on the establishment and capturing the hearts of sports fanatics around the globe, this biographical motion picture documenting Eddie’s historic showing at the 1988 Winter Olympics held in Calgary, Canada. With the aid of his unruly and charismatic American coach, Bronson Peary (Hugh Jackman) — a fictional hard-drinking, chain-smoker who pretty much feels like an amalgamation of every former-golden-boy-burnout-turned-coach depicted on screen — Eddie makes the improbable seem possible, laying bare his endearing never-say-die attitude with the world as his stage. Dubbed as a family-friendly feel-good romp in the spirit of Cool Runnings (1993) — a comedy about a Jamaican bobsled team who defied the odds and found themselves competing at (you guessed it) the ‘88 Winter Olympics — which producer Matthew Vaughn, director of Kingsman: The Secret Service (2014), cites as being a direct catalyst for getting this film off the ground, Eddie the Eagle soars with sport movie clichés. However, with such a mushy center, along with a handful of touching moments and heart-rending scenes, audiences will no doubt look past its shortcomings and just simply be inspired. While actor-turned-filmmaker Dexter Fletcher, Sunshine on Leith (2013), and first-time screenwriters Sean Macaulay and Simon Kelton, have certainly taken liberties in bringing this unashamedly British biopic to life, the narrative ultimately stays true to Michael Edwards’ arduous uphill battle, the movie being a testament to man whose success can be attributed to one thing: his unfaltering embodiment the Olympic spirit. 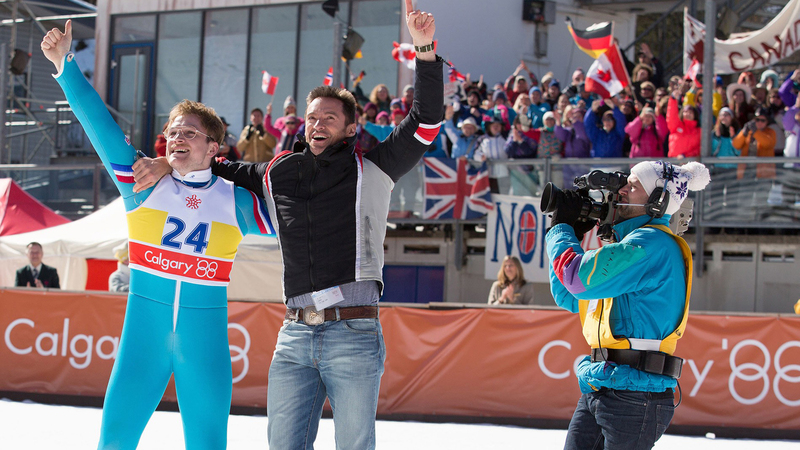 On the production front, Eddie the Eagle goes for gold and very well achieves it, the vibrant costume designs accurately encapsulating the flamboyant trends of the 1980s (think skin-tight spandex ski outfits) while the subtle use of old-school gadgetry (box-television sets and battery powered camcorders) aptly highlight the technological advancements of this decade of decadence. And to further enhance this retro vibe, we have the withered cinematography by George Richmond, Kingsman: The Secret Service (2014), along with the film’s go-get ‘em disco soundtrack — it honestly looks (and sounds) as though Eddie the Eagle were shot at some point during the said era. Strapping audiences into the hot seat, filmmakers have also discovered a way to judiciously showcase these death-defying swoops (particularly the heart-stopping 70 and 90 meter jumps) in a unique and imaginative manner. Employing a seamless combination of stunt work, CGI and helmet-cam photography, viewers are (literally) thrust down these steep slopes and then experience what it feels like to glide through the air at lightening speeds, the narrative never shying away from the life-threatening risks of performing these rather graceful (if done correctly) high altitude stunts. Going from Eggsy to Eddie, Taron Egerton, Kingsman: The Secret Service (2014), takes to the skies in his wonderfully accurate portrayal of the affable goofball Michael Edwards. Imbuing the character with the offbeat physicality/mannerisms of the real-life hero (including a heavy Cheltenham accent and Eddie’s iconic mustache), the 26-year-old Welsh actor — while bearing an uncanny resemblance to the titular dark horse — admirably brings to life the boundless optimism of the unlikely Olympian. Similarly, Hugh Jackman, The Wolverine (2013), plays to his strengths as yank Bronson Peary, Eddie’s reluctant coach who’s in need of his own brand of (overdue) personal healing, having been kicked out of the U.S. Winter Olympic team at the peak of his career. 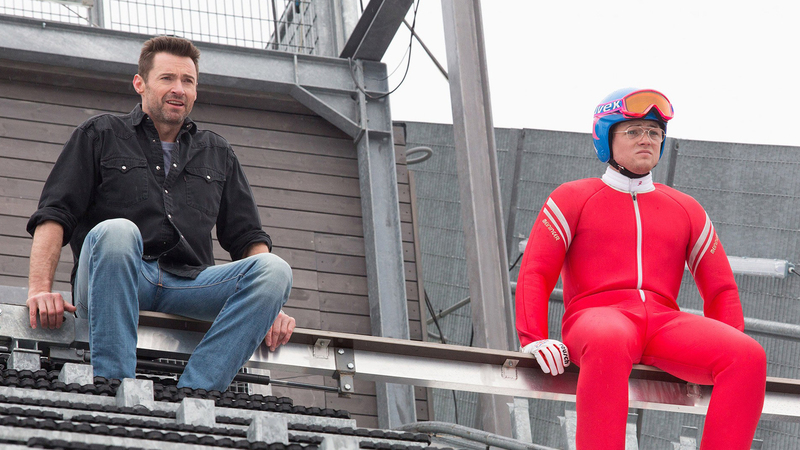 Eddie the Eagle works as a sort of redemption story for both these ‘little guys,’ who were shunned by the world at large, with the bouncy banter and burly kinship between Egerton and Jackman wholly selling the narrative’s sincerity — you really find yourself rooting for these dudes, thanks to the spirited performances by our talented leads. And oh, Christopher Walken, Hairspray (2007), pops by for a weighty bit part as the influential Warren Sharp (another fabricated character), Peary’s one-time coach (responsible for his long-ago dismissal), the veteran actor’s presence giving off the sheer importance of the big kahuna — who’s seen as somewhat of a godfather to the sport. Unfortunately, Michael Edwards’ Olympic glory was short-lived as the requirements to qualify for the ski jump category were severely increased soon after Eddie’s fifteen-minutes of fame and as a result, Eddie never qualified for the said event again: fun fact, Eddie did make it to the Winter Olympics one more time but as a torchbearer for the Vancouver Games in 2010. What Eddie lacked in raw talent he certainly made up for in enthusiasm, and while not having claimed victory in the form of an Olympic medal, Eddie personified a famous quote by the founder of the International Olympic Committee, Pierre de Coubertin, a phrase that appears onscreen during the film’s moving conclusion: ‘The most important thing in the Olympic Games is not winning but taking part.’ I may not have known much about Michael ‘Eddie’ Edwards before walking into Eddie the Eagle, but what I’ve learnt after watching this good-natured story about self-worth and courage — a fun pick-me-up that downright entertains — is that the power of perseverance can outweigh any inability. Definitely corny, but it’s hard not to get swept up in it all. Nice review.